After my last failed attempt at starting seeds for my Windowfarm, I had only one set of grow plugs and a few seeds left, so I decided to step it up for round two and invest in grow lights (they came in a box helpfully labeled “GROW LIGHTS!” which caused the front desk staff to raise their eyebrows when we picked it up in the lobby). But lo and behold, they work! 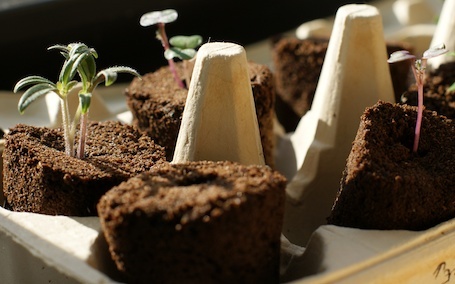 At first there were just a few sprouts – the arugula is very eager. But with 16 hours of indoor light a day and the near constant spraying of the sponges in this dry weather, we now have tiny sprouts of kale, tomatoes, shishitos, cilantro, parsley, arugula and basil. It’s really amazing to watch something this closely and now I’m afraid I will be bereft if they die on me. But I’m optimistic for a 2012 full of indoor bounty. 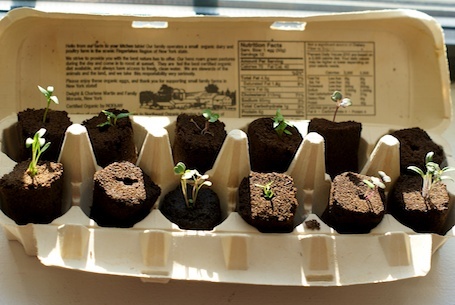 This entry was posted on December 31, 2011, 9:29 am and is filed under garden, Green, Urban Homestead, Windowfarm. You can follow any responses to this entry through RSS 2.0. You can leave a response, or trackback from your own site. You have amazing perseverence, even if it may be a harvest of Lilliputian proportions. Looking forward to following the progress.